As a research neuroscientist, Lise Eliot has made the study of the human brain her life's work. But it wasn't until she was pregnant with her first child that she became intrigued with the study of brain development. She wanted to know precisely how the baby's brain is formed, and when and how each sense, skill, and cognitive ability is developed. And just as important, she was interested in finding out how her role as a nurturer can affect this complex process. How much of her baby's development is genetically ordained--and how much is determined by environment? Is there anything parents can do to make their babies' brains work better--to help them become smarter, happier people? Drawing upon the exploding research in this field as well as the stories of real children, What's Going On in There? 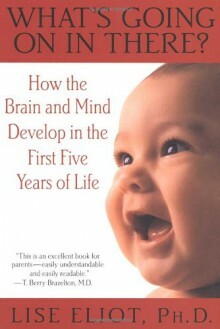 is a lively and thought-provoking book that charts the brain's development from conception through the critical first five years. In examining the many factors that play crucial roles in that process, What's Going On in There? explores the evolution of the senses, motor skills, social and emotional behaviors, and mental functions such as attention, language, memory, reasoning, and intelligence. This remarkable book also discusses: how a baby's brain is "assembled" from scratch the critical prenatal factors that shapebrain development how the birthing process itself affects the brain which forms of stimulation are most effective at promoting cognitive development how boys' and girls' brains develop differently how nutrition, stress, and other physical and social factors can permanently affect a child's brain Brilliantly blending cutting-edge science with a mother's wisdom and insight, What's Going On in There? is an invaluable contribution to the nature versus nurture debate. Children's development is determined both by the genes they are born with and the richness of their early environment. This timely and important book shows parents the innumerable ways in which they can actually help their children grow better brains.